The death toll rose to 30 after rescue workers recovered five more bodies Sunday from a coal mine explosion in southwestern China. Big Ben is the 14-ton bell inside the world’s largest four-faced chiming clock, although most people use the name to describe the tower that houses it. 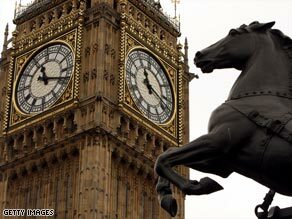 The clock is perched on a 96-meter (310-foot) elegant tower at the Westminster Bridge end of the Palace of Westminster. The Victorian masterpiece, which provides distinctive chimes known as bongs, was voted Britain’s favorite monument in 2008. It has been featured in films such as “101 Dalmatians” and “Harry Potter and the Order of The Phoenix.” Big Ben has been disrupted a few times over the years for various reasons, including weather and breakages. Its bongs went silent for about two months in August 2007 to allow a crew to repair its mechanism system. During that time, the rest of the clock was running on an electric system. It was fully restarted again October 1. The clock pays tribute to Britain’s royal history: It has a Latin inscription of the phrase: “O Lord, save our Queen Victoria the First.” The ornate masterpiece has some quirky features. The hour hand, which weighs 300 kilograms (661 pounds), is made of gun metal while the minute hands are made of copper sheet. The minute hands would not work when they were first made of cast iron because they were too heavy. The clock started working on May 31, 1859, after the lighter copper hands were installed. The origins of the landmark’s name are obscure. Some say it was named after the 1850s heavyweight boxer Ben Caunt while others suggest it was named after Sir Benjamin Hall, a former member of parliament. Hall, the commissioner of works in 1859, was responsible for ordering the bell. Alan Hughes, the director of the Whitechapel Bell Foundry that made the bell, prefers the latter. “I suppose I like it chiefly because it was a nickname of a man who was big and loud and pompous, and never used one word if 27 would do,” he said in a 2008 interview. Hughes’ company also made America’s Liberty Bell and a number of others for cathedrals and churches around the world.